Your registration will include “speed-dating” style interviews for 20 minutes with qualified candidates. 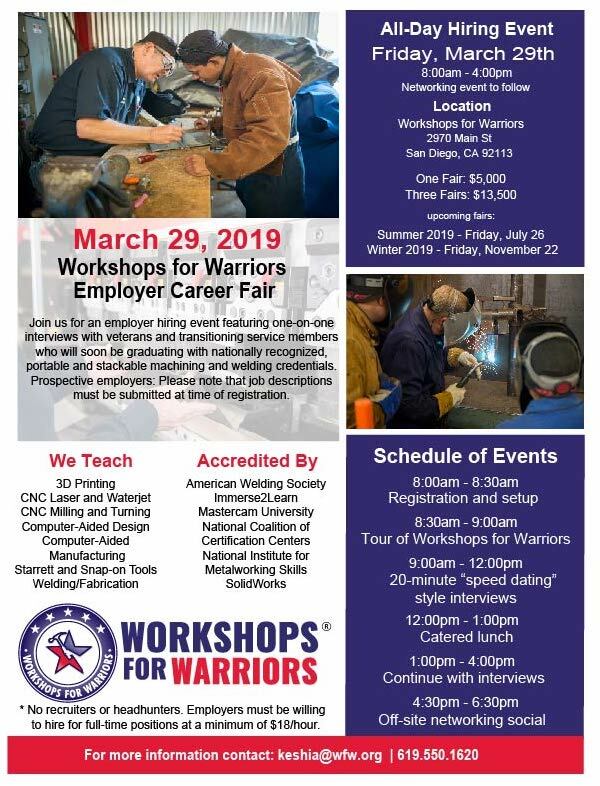 Workshops for Warriors will help select the right matches for your company’s job opportunity and the Hiring Event will include both current graduates as well as Alumni. You will have the option to register for only the March 29th event or for a discounted price you may choose to register for this event as well as our next two Hiring Events. Deadline to register is March 8th, 2019. Job descriptions must be submitted when you complete registration. No third-party recruiters or headhunters. Must be looking to hire fulltime positions at a minimum of $18 per hour. Candidates cannot begin work until after graduation on April 19th. Companies cannot poach Workshops for Warriors or VetPowered, LLC employees. Enjoy an off-site networking event following the day of interviews where you can continue your discussion with candidates and speak with Workshops for Warriors staff about the needs of your company. We encourage your participation to hire a qualified veteran at your company. Please RSVP at the link below.